Day started with Petes alarm going off at 4am. He got up to watch the Wales England game but there is no way I could watch it, so I stayed in bed with my head under the pillows so I couldn’t hear. My phone then started going nuts receiving messages, so I knew something was afoot. Heard Paul and Clare moving around, then Pete scrabbling at my door – and I knew it would be good news. YES! Wales beat England at Twickers!!! A flurry of messages, texts and all sorts of celebratory items followed as we drank coffee and thought about getting ready to depart. Filled with water, emptied rubbish, then headed off around 9. 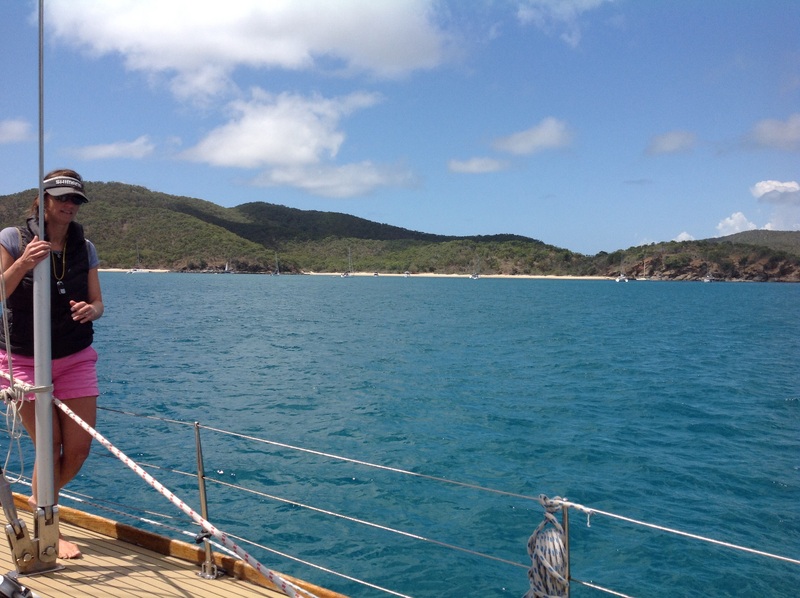 It was slightly cloudy and not as warm as yesterday, but we sailed almost all the way to Great Keppel Island. We anchored at Svensen Bay, in 7 m of water, watching the sonar all the way in. 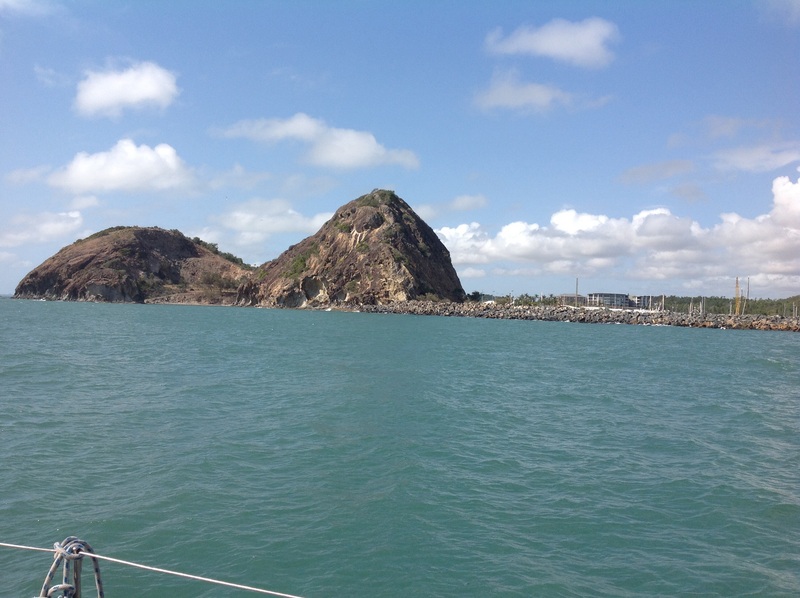 Then we downloaded budgie and headed up to the north end of the island to snorkel. It was cool driving into the breeze and a tad damp, but the water was pleasant when we arrived and we managed about a 20 minute snorkel. Vis was ok, but not brilliant, but we saw lots of fish, cuttlefish and some coral. We then headed back to the boat for lunch. Lunch of chicken Caesar salad was followed by a nap for all except Clare. I awoke to the call of “time for sundowners” and we headed for the beach with a jug of pims, a cheese platter and some beers. We arrived at the “camp”, and settled in, followed rapidly by Russel and Jan from About Time, then a series of other crew and dinghies, until there was a big crowd of us around the camp fire, chatting and swapping stories. We picked up more Intel about North West Island and decided to change our plan from leaving at 10 pm tonight to 5 am tomorrow instead and making North West Island our destination. We headed back to the boat for dinner of lamb chops, green cous cous and roast veg, and resolved our travel plan for tomorrow. A subdued crew cleaned up the dinner stuff, and headed for an early night by 9:30 pm. 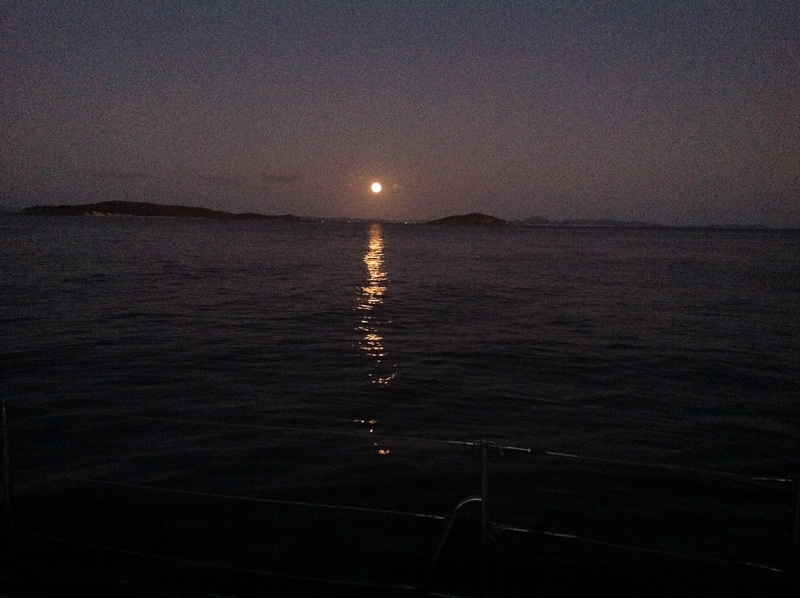 It’s a slightly rocky anchorage, but a bright, nearly full moon. See you in the morning.